See Also: Book Notes, Blank Slate, Info Viz & Perception, On Intelligence, The Quest for Consciousness, The Stuff of Thought, Neuroscience of Human Relationships. Michael S. Gazzaniga, Harper Collins (2008), ISBN-13: 978-0060892883 - 447 pages, 390 text, 40 notes, 15 index. 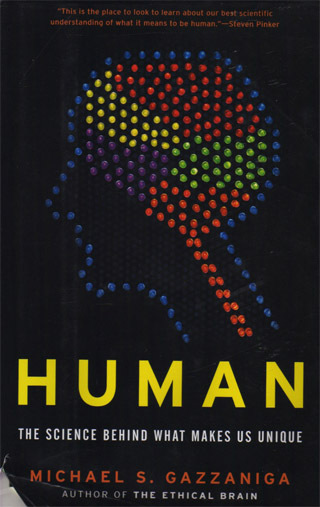 There are a couple of sections of Human: What Makes Us Unique that make the book unique. The chapter on the Arts makes it clear why they are important to us as humans. The wrap up chapter starts with consciousness and wanders thru external, surgical and genetic enhancements to our species. I strongly recommend this meaty exploration of humans with lots of summaries and references to current research. They calculated that one genetic variant of microcephalin arose approximately 37,000 years ago, which coincides with the emergence of culturally modern humans, and it increased in frequency too rapidly to be compatible with random genetic drift or population migration. This suggests that it underwent positive selection. An ASPM variant arose about 5800 years ago, coincident with the spread of agriculture, cities and the first record of written language. It too is found in such high frequencies in the population, that it indicates strong positive selection. p. 94 - gossip: universal and beneficial as social grooming. Humans have evolved two capabilities that are neccesary for prolonged reciprocal social exchange: the ability to inhibit actions over time (that is, delayed gratification) and punishment of cheaters in reciprocal exchange. These currently are on the short list of uniquely human capacities. - moral emotions: sympathy, anger, guilt, shame, and gratitude. - virtues: sense of fairness, justice, trustworthiness, and patience. - moral emotions: compassion, contempt, guilt, embarrassment, and gratitude. - moral virtues: trust cooperation, self-sacrifice, loyaly, patriotism, and heroism. To test whether there might be a module that specialized in coalition recognition rather than race recognition, which did not make evolutionary sense, Kurzban, Tooby, and Cosmides created a social context in which race was not predictive in cooperative alliance. They found this drastically decreased the extent to which subjects noticed race. They also demonstrated that any visual marker (they used shirt color) that is correlated with patterns of cooperation and alliance would be encoded, and in fact more strongly than race. It was only four minutes into the experiment when the subjects no longer noticed race. They concluded that people are good at picking up on changing patterns of alliance, and this is why they can adapt to different social worlds, one where race was not the coalition predictor. p. 192 temporoparietal junction (TJP) - right inferior parietal cortex and the posterior temporal cortex plays a critical role in the distinction between one's own actions and another's. Failure at the TJP leads to out of body experiences. p. 217 Dissanayake speculates that the creation of art in terms of human evolution was "to facilitate or sugarcoat socially important behavior, especially ceremonies, in which group values, often of a sacred or spiritual nature, were expressed and transmitted." Also, Aesop's Fables, or Grimm's Tales, they pass "old wives tales" down thru the generations. It is more than just advice, tho. It is the ability to try on another narrative - to explore other possibilities for how to be in the world. The last section is entitled "Who needs flesh" and is a wonderful meandering from research nugget to research nugget, from people researching how to "jack in" to claims that our tools make us "fyborgs". Cochlear implants are a small step to the borg with artificial retinas coming along. From exoskeletons that allow a quadriplegic to walk to genetic modifications to make us smarter. Here is just a single thing to pass on: Finishing Human, the science of what makes us unique. The Andersen Lab wants to hook into brain at planning phase instead of muscle movement phase. It is easier to tell the robotic help to do task than to hook it into the fine muscle loop. p. 353 - rehearsal loops. Practice makes perfect. No other animals practice to refine their skills and considering that group practice is an important part of many human activities, this is one of the things that makes us unique. (Merlin Donald). He [Rodney Brooks] thinks we overanthropomorphize humans, "who after all are mere machines". I'm not sure that, by definition, it is possible to overanthropomorphize humans. Perhaps it is better to say we underanthropomorphize machines or undermechomorphize humans. *in my own editorial mind, I wonder why Republicans do not see the value of public Art. I guess they are not part of all cultures? Or perhaps, just not cultured? What I would change about this book: put names of researchers discussed in index.